Annisquam Yacht Club teammates Peter Thibodeau and Grace Papp maneuver in a 420-class race Monday. 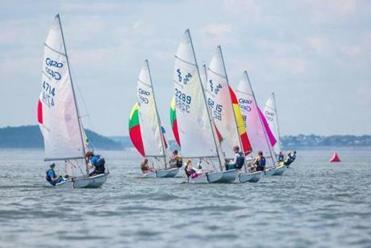 GLOUCESTER — Cars lined the narrow streets of the Annisquam section of town, and 170 sailboats clustered under bright blue skies on Ipswich Bay for the Massachusetts Bay Junior Olympic Sailing Festival. Starting on the heels of the Summer Olympics — sailing’s preeminent showcase along with the America’s Cup — the event drew the best young sailors from Maine to Cohasset on Monday and Tuesday. Races scheduled for Wednesday were canceled because of morning rain and thunder. The ages of the competitors run from 8 to 18, and one can trace the development of the sailors, from steadfast 8-year-olds in the Optimist class of boats — think of a buoyant bathtub with a sail — to teenagers developing skills that will carry on to future levels of competition. Skipper Thomas Walden and crew member William Hundahl of the Pleon Yacht Club in Marblehead took first place by winning five of seven races in the 50-boat C420 Class at the Massachusetts Bay Junior Olympic Sailing Festival held Monday and Tuesday in Gloucester. Organized by US Sailing under the umbrella of the US Olympic Committee, the event rotates each year among clubs on the North and South shores. One such sailor was 24-year-old Evan Cooke of Andover, a former Junior Olympic competitor who is now an assistant sailing coach at Boston College, where he was on the sailing team, and a member of the race committee for this year’s event. 420-class sailboats race across Ipswich Bay on Monday. Skipper Peter Thibodeau, 14, and crew member Grace Papp, 15, were among the teams from the Annisquam sailing program. Competing in the 420 class, they had placed in the top five at regattas in Hingham and Marblehead this summer, and on Aug. 8 won the Tim Baker Regatta at the Sandy Bay Yacht Club in Rockport. The club’s junior program enjoyed a good season this year, and Papp was looking forward to last week’s competition. However, the duo had trouble getting untracked, and finished 21st in the 50-boat C420 class. “This is our final shebang – the last regatta of the year to show everybody who we are and what we’re made of,” Papp said. Thibodeau said they liked the test that came from racing better-skilled sailors. “The competition pushes us to work harder,” he said. There is more to winning sailing than simply going fast. There is skill but also strategy that involves recognizing the wind conditions, the currents, and the rest of the field, over multiple days and amid conditions that change. “A lot of people think it’s just the wind, the water and you — which is important — but then you’ve got to think about who’s on top of you, who’s covering you, who’s starboard, who’s port, who’s coming up the left side, and which way the [group] is tacking and how you want to stay on top of them,” Papp said. “It really does matter to watch the boats. If you know everything you can about where the wind’s going, and know that you can catch it, you can still lose the whole race just because you’re not paying attention to everybody else. Just as athletes in baseball thrive in the warm weather of Florida, California, and the Dominican Republic, and hockey players develop best in the cold of the northern US and Canada, most great sailors come from coastal areas. The stretch from New England to Maryland is one of the great developmental areas for sailing, Cooke said, joining Florida and California. Cooke noted that many Olympians will train in Massachusetts because they have both the support infrastructure for competitive sailing, and because traveling up and down the coast can provide an interesting mix of sailing conditions without a lot of travel. 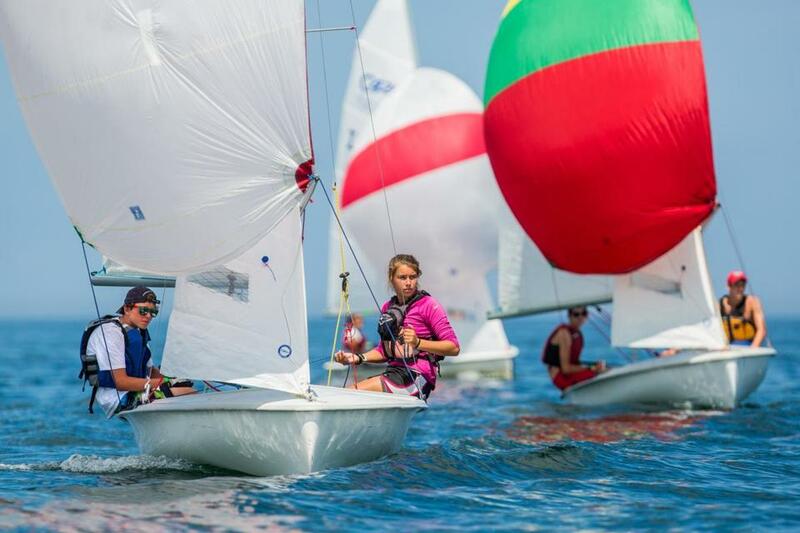 The Junior Olympic sailing championships can be a precursor to future competitions. During the regatta, the competitors and their families basically doubled the area’s population. After the races, the sailors would gather for a meal and relaxation under a large tent on the Annisquam Yacht Club’s tennis courts while their parents socialized on the deck. Coming from the tent area, Bob Thibodeau, Peter’s father, pointed out another benefit for the young competitors. E-mail David Rattigan at drat­tigan.globe@gmail.com.